Lubaantun is one of the most significant of the Mayan costal cities located in Belize. While major constructions at Lubaantun continued for only 160 years, from 730 to 890 AD, it nevertheless seems to have been a thriving commercial and ceremonial centre. Jade & obsidian from the Guatemalan highlands have been found here along with the bones of deep water marine animals, signifying trade. Musical instruments, including many carved whistles have also been uncovered. 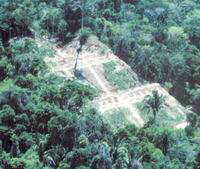 It is the largest site in southern Belize consisting of 11 structures and 3 ball courts around 5 main plazas. 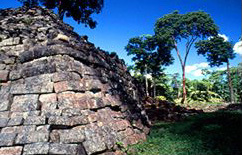 Structure 12, part of which appears in the photo above, is depicted on the Belize $2 bill. Unfortunately, Lubaantun is another site that has the distinction of being excavated in part by the explosive Dr. Thomas Gann, in 1903. Some of the structures in Plaza IV still bear the marks of his enthusiasm. In 1915 Harvard University sent R. Merwin to investigate the site. He recognized a ball court and discovered three carved markers depicting the game. They still remain at the Peabody Museum. He died before he could publish his accounts of the site. Famous archaeologists T.A. Joyce & Eric Thompson were in Lubaantun in 1926 - 27. This was also about the time that the "Crystal Skull" appeared. In the 1970's, joint expeditions by Harvard & Cambridge Universities brought much of what we now know about Lubaantun to light. There is very Little in the way of structural ornamentation at this site. Perishable wooden buildings placed on top of the limestone platforms could possibly have been decorated. There are no carved stelae here. 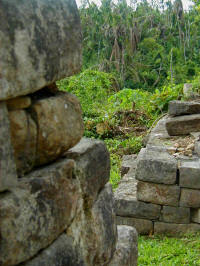 The beauty of Lubaantun is in its form - its rounded corners and curves are like no other Maya site. The blocks use no mortar but are chiseled so precisely that the buildings maintain their graceful line, even in collapse. Tucked in a corner to the east is a small plaza, Plaza XII, that contains a covered alter. Remains of offerings have been found on its floor. It is easy to imagine a citizen coming here to make a private offering away from the crowds at main ceremonial center. The setting in the foothills of the Maya Mountains is absolutely breathtaking and on a clear day, if you face the right way, you can see the Caribbean Sea.The name Lubaantun means "place of fallen stones". 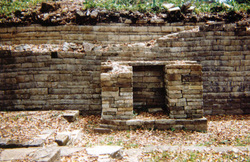 This is an apt name for this site because of the dry masonry style of architecture found only in Southern Belize. 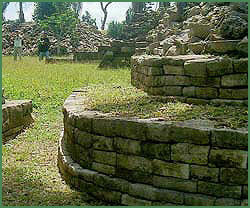 The pyramids at Lubaantun are man-made stone platforms on top of which stood perishable buildings. The large pyramids and temples are constructed of dressed stone without any mortar. Decorations and carvings are lacking at Lubaantun. Most of these would have been done on the wooden structures on the temple's summit. Moreover, in marked contrast to Nim Li Punit, there is an absence of carved stelae at Lubaantun. The ceremonial center of this site has 11 major structures grouped around five main plazas. Archaeologists have determined that Lubaantun was constructed based on a plan of zones. The inner zone consisted of religious buildings. Outside of the inner zone lay a zone of ceremonial structures which included ball courts. The outside zone consisted of residential buildings. The center of the site lies along a ridge top twenty miles from the sea. In contrast to other sites, the Maya of Lubaantun took to shaping the ridges and slopes of the hilltop rather then leveling it off. In effect, the summit of the ridge was widened and flattened into platforms. The largest structure at Lubaantun rises 36 feet above the plaza floor. From the summit of this structure there is a beautiful view of the foothills of the Maya Mountains and the Toledo coastal plains. Lubaantun was first reported in 1903. Expeditions in 1915, 1926, and 1970 followed. Most important was the work done by Norman Hammond. He mapped the region and determined its period of occupation as 730 A.D. to 890 A.D. This site then was a Late Classic site, one of the last major sites in Belize prior to the collapse of the Maya. Hammond also attempted to explain and describe the linkages of the different sites in the region and the possible trade routes. Hammond constructed a model of these linkages using Lubaantun as the focus of what he called a realm. The Lubaantun realm was estimated to cover 625 square miles. The realm was divided into environmental zones ranging from high plateaus to offshore islands. Each of these zones had advantages and disadvantages to living there. Each zone could provide certain resources while requiring trade to obtain others. 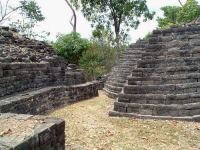 Lubaantun was a focus point for this trade among zones. Goods would be brought to the center and then redistributed. For example, from the mountains would come volcanic stone for axes and metates;corn and beans would come from the foothills of the Maya Mountains; from the coastal plain would come seafood, wildfowl and a variety of medicinal plants. The Rio Grande River would be a major artery of trade, connecting the sea to Lubaantun. In fact, large quantities of shells were found at Lubaantun. Many archaeologists feel that Hammond's theories of how separate Mayan sites related to each other through trade - based on excavation, ecological analysis and artifacts - is a huge step toward understanding the heritage of Belize and of the Mayan Civilization in general.